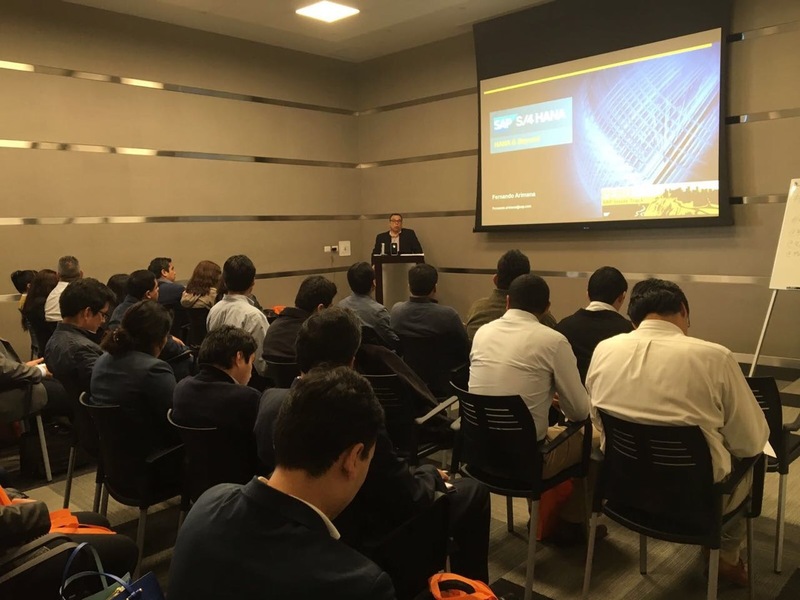 Last Friday, October 7th, we had the 2nd SAP Inside Track event in Peru and 3rd community event in this South America country. 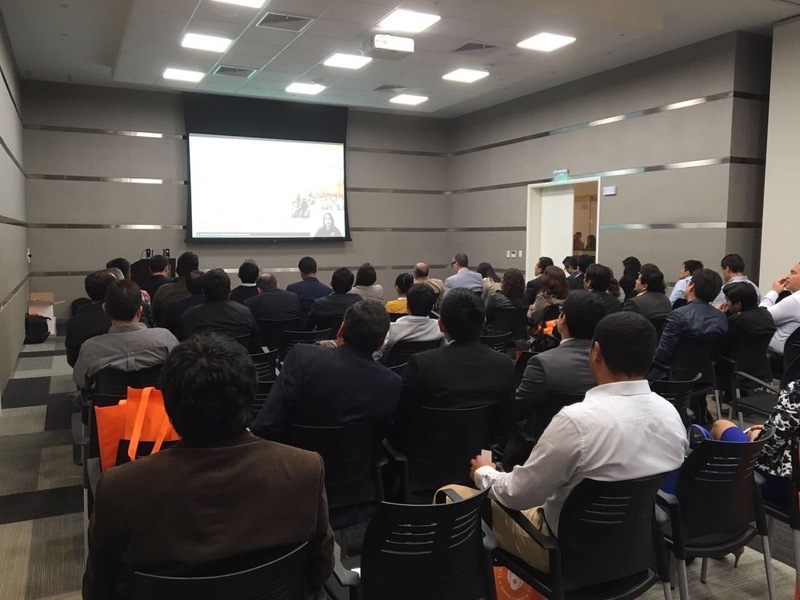 The first two, organized by SAP Mentor Alumni Alvaro Tejada Galindo (Blag), happened in 2008 and 2009, so in the last 6 years there was a lack of community events there. 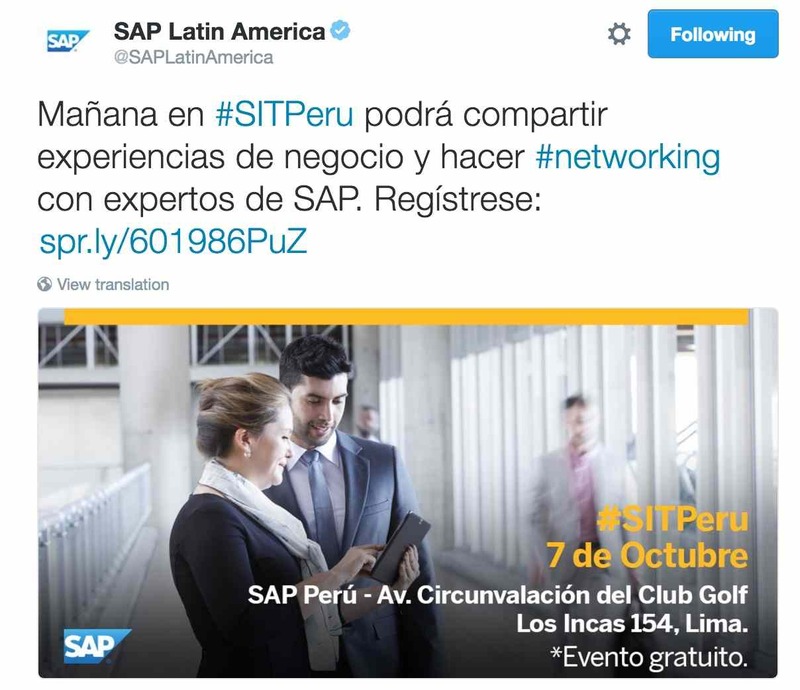 SIT Peru took place in Lima, at SAP office. Around 80 people attended and more than 200 registered, a number that was a great surprise for us. After 6 years we didn’t know what to expect. With the help of Ruth Zamudio, who currently lives in Germany but is from Peru, of SAP Peru Marketing (Alex Quintanilla and his team), and of Blag, who is also from Peru and lives in US, we could reach Universities, partners, customers and independent consultants, receive more session proposals than we expected and make a very nice event. 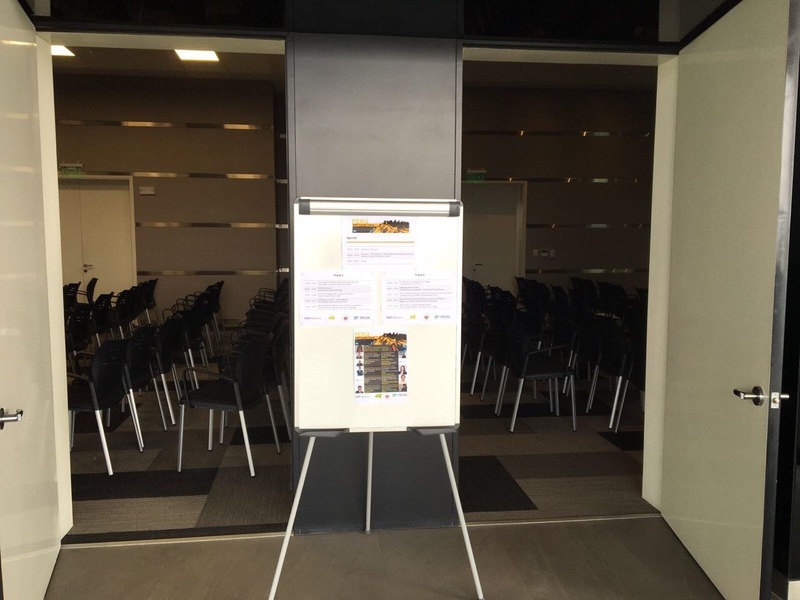 We had more proposals than the Agenda could fit, so unfortunately we needed to select the sessions and leave some speakers out in this edition, but we hope we can give a new opportunity to them in the next event. This SIT proved that organizing an event with people located in different countries is possible when all of them have the same goal: make it happen in the best way possible. Community matters. We all found time in our busy agendas to meet online, split the tasks and execute them. Ruth was part of the time on vacation, including the day of the event! We had a fantastic team. The event was totally held in Spanish, as it is supposed to be in a Spanish-speaking country. Even me and Marssel, Brazilians with Portuguese as native language, spoke in Spanish during the keynote. Unfortunately we could not be there onsite with Ruth, so our session was remote. All the other speakers were from Peru which really made this SIT a local community event. In the keynote we explained what SITs are all about, what is the SAP Mentors program and why SAP Mentors matter, and also gave an introduction to the new SCN, this one we are using right now, that was just about to go live. The sessions were about themes that the attendees were looking forward to hearing about, based on their answers in the registration form. 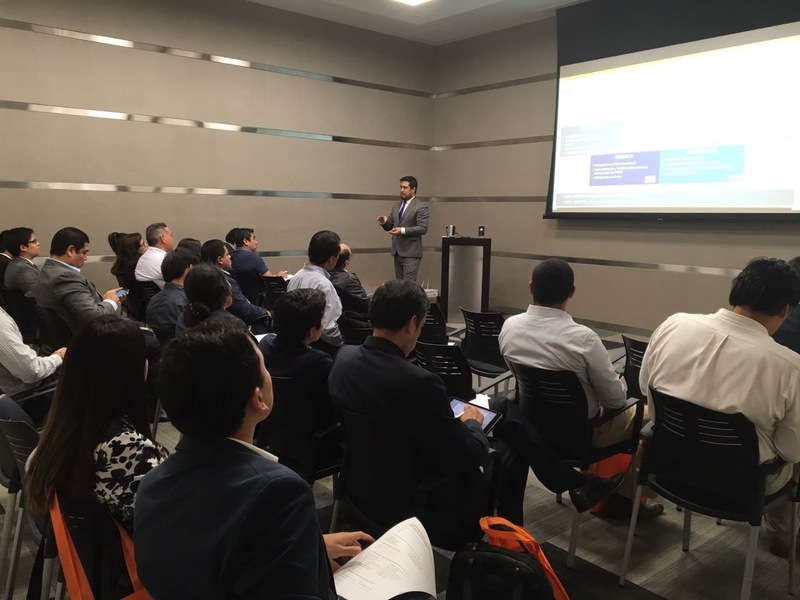 Speakers represented customers, SAP partners, SAP employees, Independent consultants and a University. Something very interesting is that 16% of the attendees were students, from 8 Universities! Amazing! 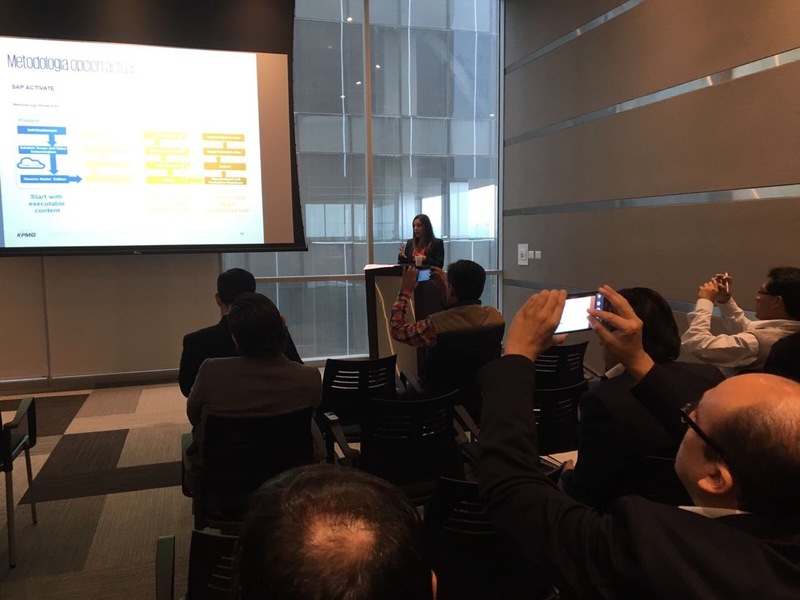 SIT Peru was supported by Universidade de Lima (UL), and one of the speakers, currently working for a SAP partner, was an ex-student of UL. Themes were related to SAP HANA, S/4HANA, HEC,Digital Transformation, SAP UX, SAP BPC, SAPUI5, SAP HANA Cloud Platform, SuccessFactors, Tools to support implementation of Cloud solutions and SAP Hybris C4C. 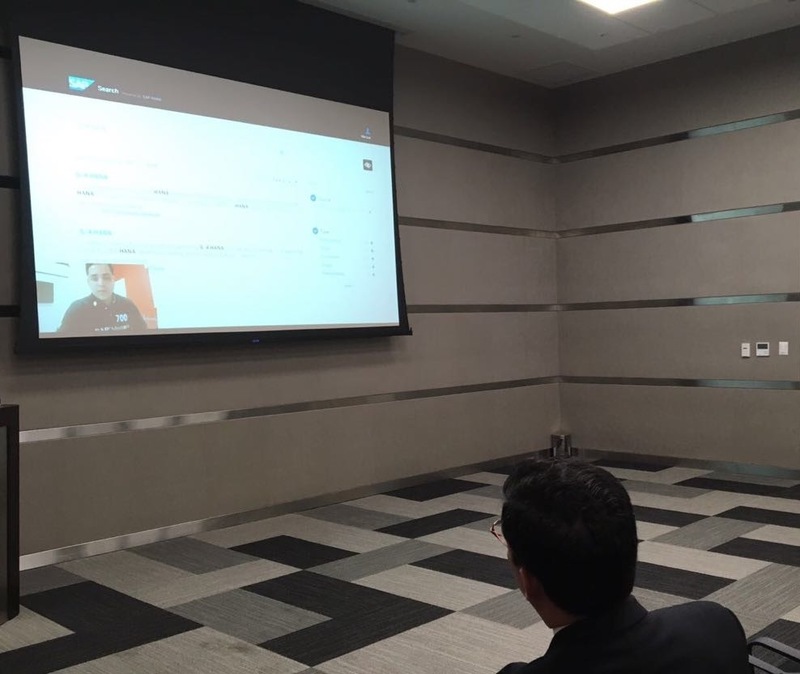 Blag presented a remote session from Palo Alto about SAP d-shop. Below I share some pics of the event. The complete list of photos taken by Ruth are here. Entrance of the 2 beautiful rooms at SAP office. 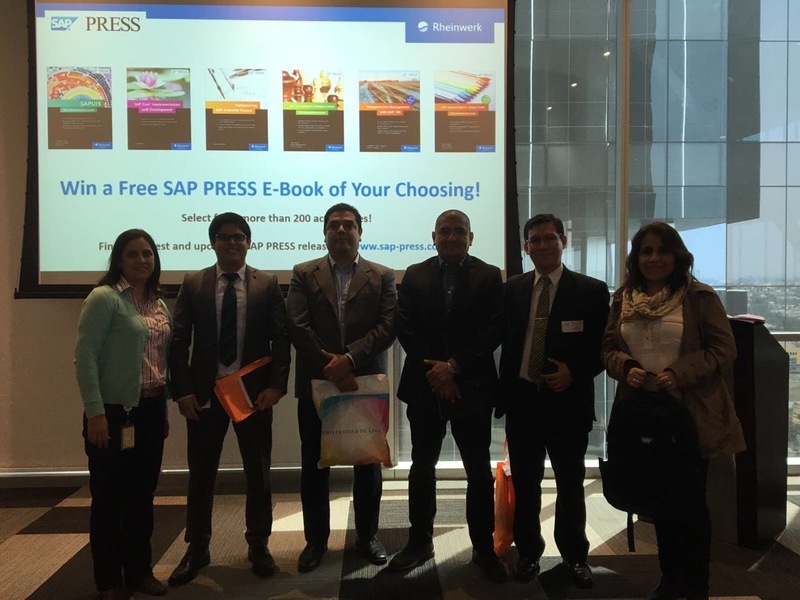 As in most of the SITs, SAP Press sponsored the event with some e-books to give away and discount for all attendees. UL gave away some gifts too. Below the picture of Ruth with the winners. 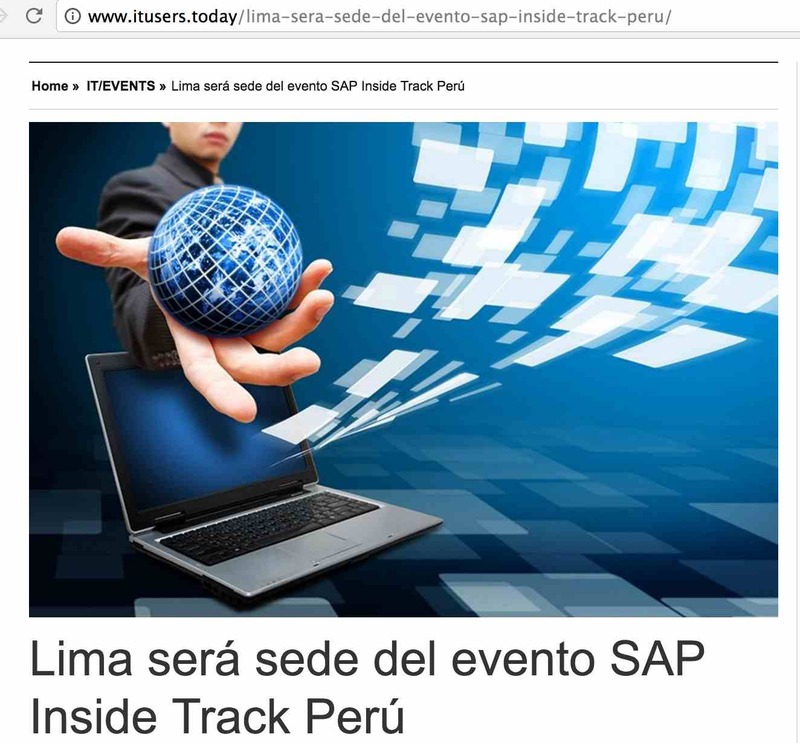 SIT Peru also had the support of Everis Perú and local SAP. I would like to thank all the attendees, speakers, sponsors and organizers for making happen a great event. I enjoyed a lot the experience. 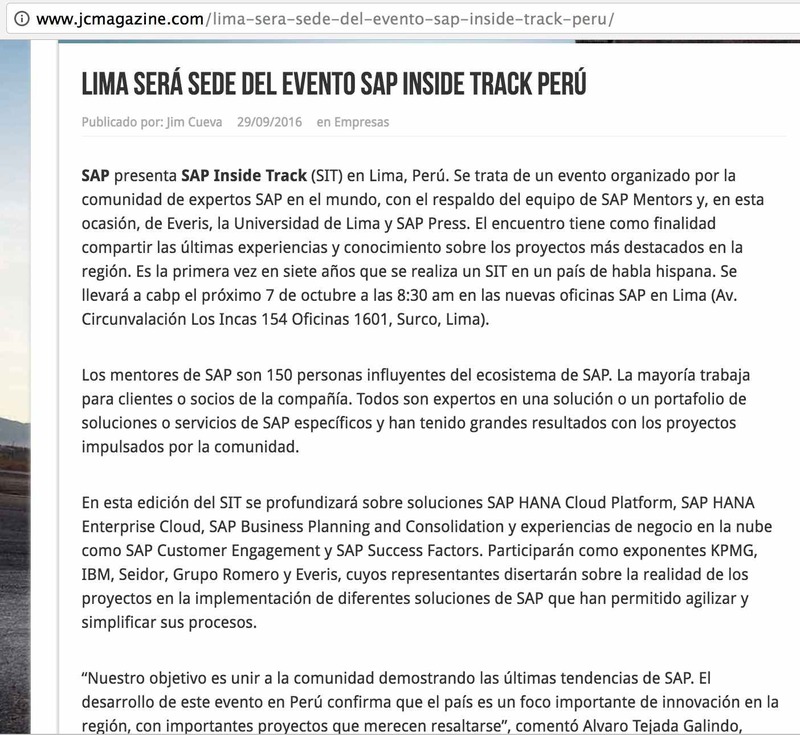 I really hope that Peru continues to have SAP Inside Tracks in the next years, and I will be always ready to help. 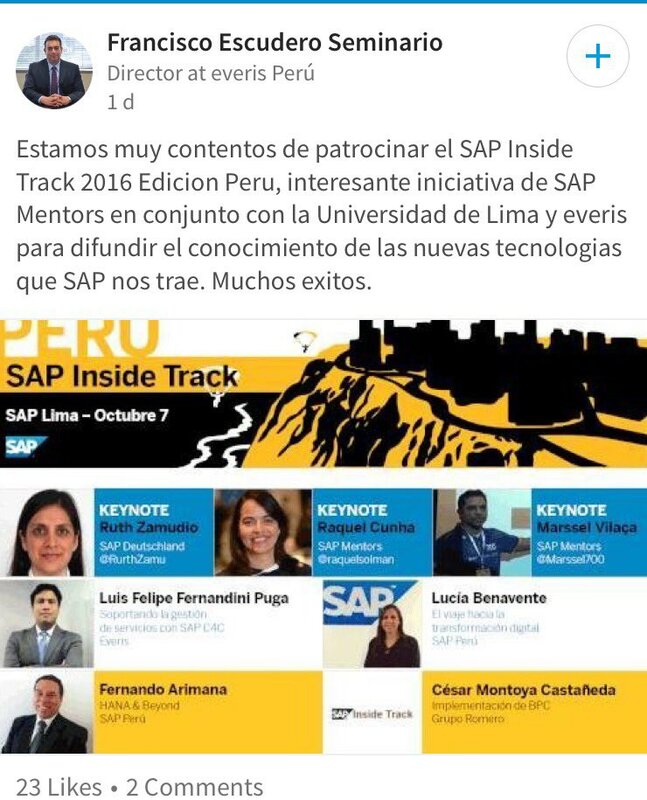 As I mentioned in my part of the keynote, anyone can organize a SIT, it’s a local event made for the community by the community, so if you want to organize one in your city or want to help next year to organize another SIT in Lima, don’t hesitate to contact the SAP Mentors, Blag or Ruth. We will be happy to support you! This event was pleasant since the beginning of organization until the end of the event. I felt a great collabotation spirit from the organizers, speakers and sponsors. I am sure the participants had a good impression. I totally agree when you said SIT is a local community event! It is very important have a local community active and referenced professionals. Thanks for sharing this with the community Raquel! You and other organizers did a fantastic job! This is a really excellent example of collaboration between community members. Thanks to SAP experts, SAP Mentors and Alums and SAP colleagues for your effort and vision to create a really engaging and educational event for everyone to experience!